Rashed Fakhruddin, president of the Islamic Center of Nashville, recently visited campus to speak to first-year students in Belmont’s Honors Program. 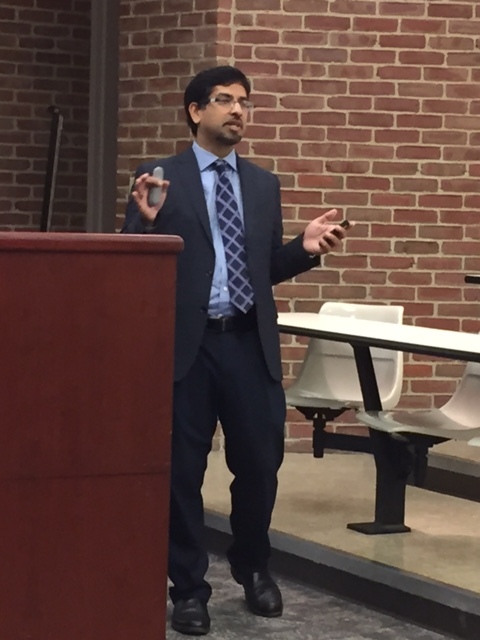 Fakhruddin spoke in one of the classes that is required for students in their first semester titled “World Traditions of Faith and Reason,” which examines five major world religions and discusses issues of religious origins, sacred rituals and living faith communities. The class analyzes Judaism, Christianity, Islam, Buddhism and Hinduism and discusses the tenets and backgrounds of each. One of the objectives within the class was to apply students’ knowledge of these world religions to this year’s common book in the Honors Program, which is read by all first-year students. The book, titled “The Submission” by Amy Waldman, is a work of fiction that follows an architecture competition for a 9/11 memorial in New York and involves a designer who is an American Muslim at a time when emotions and fear are running high. Fakhruddin is well-known in Nashville for presenting on Islam to universities, schools and churches that aim to develop a better understanding of Muslims while fostering stronger relationships within Nashville’s faith community. He is a founding member of the American Muslim Advisory Council, which works to help build bridges between Muslims in Tennessee and law enforcement officials as well as other government agencies. As a result of his work in the community, Rashed has received many awards including Pencil Foundation’s Volunteer of the Year Award (2015), the Women’s Political Collaborative of Tennessee’s Good Guys Award (2015) and the Community Nashville Human Relations Award (2016). Fakhruddin also has a daughter who is attending Belmont as a sophomore psychology major.